Three big agricultural nutrient companies made impressive gains last month. Shares of Potash Corp (NYSE:POT) and Agrium (NYSE:AGU) rose by nearly 10% each last month after providing an update on their previously announced merger. Meanwhile, Mosaic Co (NYSE:MOS) and CF Industries (NYSE:CF) rose over 20% each on a rising tide. All four companies have reported quarterly earnings since October 27. None of the major producers announced particularly strong financial results, as multiyear headwinds continue to impact the fertilizer industry. Potash Corp achieved third-quarter 2016 EPS of just $0.10 -- a far cry from levels investors became accustomed to a few short years ago. It marked a 70% drop compared to the year-ago period and set the tone for quarterly results from peers announced in the following days. Agrium reported a loss per share of $0.29 (compared to positive EPS of $0.79 in the year-ago period), Mosaic Co reported EPS of $0.11 (compared to EPS of $0.45 in the year-ago period), and CF Industries reported a loss per share of $0.13 (compared to positive EPS of $0.39 in the year-ago period). The mediocre performance of the industry wasn't exactly a shock to investors. 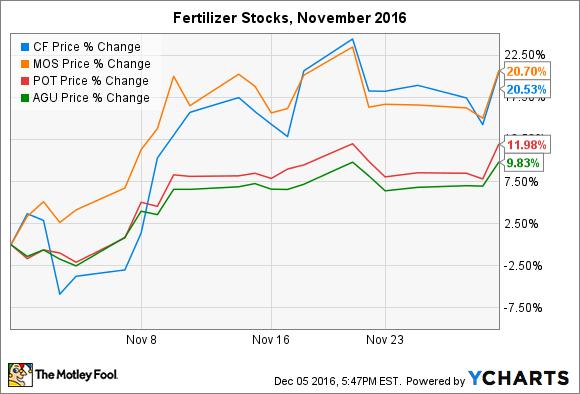 But fertilizer stocks rose on a rising tide of enthusiasm for favorable market trends and falling operational expenses heading into 2017, which could set the tone for a long-awaited recovery in potash, nitrogen, and phosphate prices. Potash Corp sold a record volume of potash during the third quarter and told investors that spot prices are 15% higher than the lows set earlier this year. That's a rare combination of good news, as higher sales volumes have been the result of lower prices recently. Higher demand and higher prices hint that inventories are lower, which is exactly what each company reported for each major nutrient. As it turns out, customers balked en masse at gobbling up nutrients in the second half of 2016 to wait out uncertainty in export markets -- higher volumes were expected to push prices lower -- but that has had mixed results. For instance, potash and phosphate sales volumes are expected to increase in the fourth quarter for Potash Corp, Agrium, and Mosaic, partially from their involvement in the Canadian fertilizer cartel, Canpotex, which is sold out for the remainder of the year. Meanwhile, nitrogen prices are rising on falling Chinese exports, which are falling because higher input costs have forced nearly 8 million metric tons of its capacity off the market. That means a lower volume of higher-priced Chinese exports is right around the corner, although that will be offset by a reduced appetite for nitrogen on American farms in the fourth quarter and early 2017. The good news is that it really does seem plausible for fertilizer prices to increase in the next 12 months or so. The bad news is that a full-fledged recovery could take quite a bit longer -- measured in years. Luckily, further reductions in operating expenses for the industry bodes well for each company's ability to weather the foreseeable future, so long as increased volatility and uncertainty doesn't return to global commodities markets.